Heloderma suspectum, also known as the venomous Gila monster lizard. 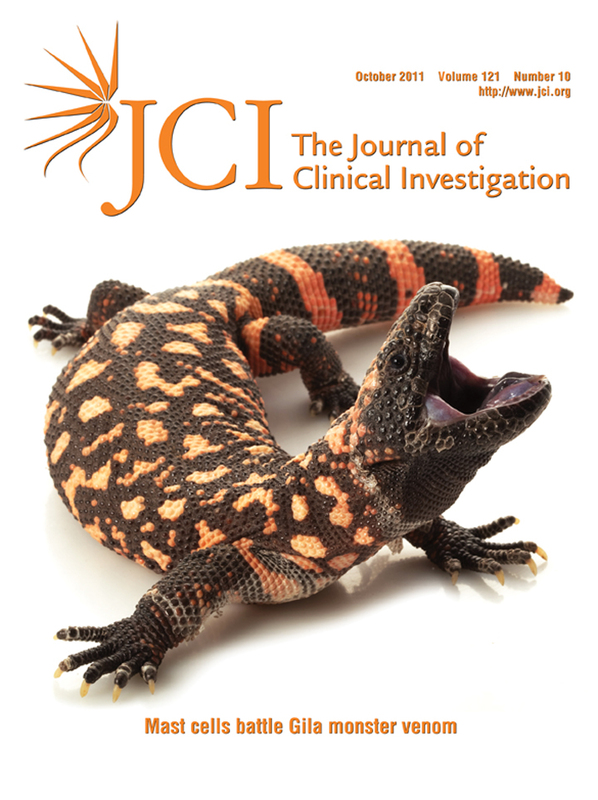 In this issue, Akahoshi and colleagues investigated whether mast cells can enhance resistance to the venom of the Gila monster (page 4180). Using two types of mast cell–deficient mice as well as mice selectively lacking mast cell–derived protease activities, the authors found that mast cells can enhance host resistance to the toxicity of Gila monster venom and can reduce the morbidity and mortality induced by venoms from two species of scorpions. Citation Information: J Clin Invest. 2011;121(10):3765-3765. https://doi.org/10.1172/JCI60752. Citation Information: J Clin Invest. 2011;121(10):3768-3773. https://doi.org/10.1172/JCI60887. Citation Information: J Clin Invest. 2011;121(10):3774-3777. https://doi.org/10.1172/JCI60889. Citation Information: J Clin Invest. 2011;121(10):3778-3781. https://doi.org/10.1172/JCI60890. Citation Information: J Clin Invest. 2011;121(10):3782-3782. https://doi.org/10.1172/JCI59258. Citation Information: J Clin Invest. 2011;121(10):3783-3783. https://doi.org/10.1172/JCI58839. Citation Information: J Clin Invest. 2011;121(10):3786-3788. https://doi.org/10.1172/JCI60534. Breast cancer is a heterogeneous disease. There is a high degree of diversity between and within tumors as well as among cancer-bearing individuals, and all of these factors together determine the risk of disease progression and therapeutic resistance. Advances in technologies such as whole-genome sequencing and functional viability screens now allow us to analyze tumors at unprecedented depths. However, translating this increasing knowledge into clinical practice remains a challenge in part due to tumor evolution driven by the diversity of cancer cell populations and their microenvironment. The articles in this Review series discuss recent advances in our understanding of breast tumor heterogeneity, therapies tailored based on this knowledge, and future ways of assessing and treating heterogeneous tumors. Breast cancer — one term, many entities? Citation Information: J Clin Invest. 2011;121(10):3789-3796. https://doi.org/10.1172/JCI57100. Breast cancer, rather than constituting a monolithic entity, comprises heterogeneous tumors with different clinical characteristics, disease courses, and responses to specific treatments. Tumor-intrinsic features, including classical histological and immunopathological classifications as well as more recently described molecular subtypes, separate breast tumors into multiple groups. Tumor-extrinsic features, including microenvironmental configuration, also have prognostic significance and further expand the list of tumor-defining variables. A better understanding of the features underlying heterogeneity, as well as of the mechanisms and consequences of their interactions, is essential to improve targeting of existing therapies and to develop novel agents addressing specific combinations of features. Citation Information: J Clin Invest. 2011;121(10):3797-3803. https://doi.org/10.1172/JCI57152. In recent years the description of well-defined molecular subtypes of breast cancer, together with the identification of the driving genetic alterations and signaling pathways, has led to the clinical development of a number of successful molecular targeted agents. This is best exemplified in the subset of HER2-amplified breast cancers, in which an increasing number of active agents are changing the natural history of this aggressive disease. Other targets are under exploration, and the clinical development of these agents will require a change from the current large, randomized trials in unselected patient populations to smaller trials in groups with a molecularly defined tumor type. In addition, combinatorial approaches that act on the secondary mutations and/or compensatory pathways in resistant tumors may markedly improve on the effects of targeted agents used alone. Citation Information: J Clin Invest. 2011;121(10):3804-3809. https://doi.org/10.1172/JCI57099. Many tumors, including breast cancer, are maintained by a subpopulation of cells that display stem cell properties, mediate metastasis, and contribute to treatment resistance. These cancer stem cells (CSCs) are regulated by complex interactions with the components of the tumor microenvironment — including mesenchymal stem cells, adipocytes, tumor associated fibroblasts, endothelial cells, and immune cells — through networks of cytokines and growth factors. Since these components have a direct influence on CSC properties, they represent attractive targets for therapeutic development. Citation Information: J Clin Invest. 2011;121(10):3810-3818. https://doi.org/10.1172/JCI57088. Rapid and sophisticated improvements in molecular analysis have allowed us to sequence whole human genomes as well as cancer genomes, and the findings suggest that we may be approaching the ability to individualize the diagnosis and treatment of cancer. This paradigmatic shift in approach will require clinicians and researchers to overcome several challenges including the huge spectrum of tumor types within a given cancer, as well as the cell-to-cell variations observed within tumors. This review discusses how next-generation sequencing of breast cancer genomes already reveals insight into tumor heterogeneity and how it can contribute to future breast cancer classification and management. Citation Information: J Clin Invest. 2011;121(10):3819-3821. https://doi.org/10.1172/JCI60003. In the 18th century, Thomas Bayes developed his eponymous theorem that teaches us that pretest probabilities can be altered by new information, such as when game show host Monty Hall revealed the goat behind one of the remaining doors in “Let’s Make A Deal.” Bayesian analysis is a key feature of many medical decisions. In this issue of the JCI, Lee and colleagues apply this concept to inflammatory bowel disease to identify gene expression–based biomarkers of disease severity. Importantly, these biomarkers allowed patients to be stratified into two groups: those at high risk for disease recurrence or the need for immunosuppressive treatment escalation and those with a more benign disease course. Citation Information: J Clin Invest. 2011;121(10):3821-3825. https://doi.org/10.1172/JCI60002. Deciphering the complexities of human β cell physiology is critical to our understanding of the pathophysiology behind both type 1 and type 2 diabetes. One way to do this is to study individuals with congenital hyperinsulinism (CHI), a rare genetic disease characterized by dysregulation of insulin secretion resulting in hypoglycemia. In this issue of the JCI, Henquin et al. report in vitro studies of pancreatic tissue obtained from CHI patients during therapeutic pancreatectomy that have yielded exciting new insights into human β cell physiology. The data validate and extend observations made in model organisms. Citation Information: J Clin Invest. 2011;121(10):3825-3827. https://doi.org/10.1172/JCI60457. Atherosclerosis is a chronic inflammatory disease of the arterial walls that often leads to myocardial infarction and/or stroke. Hypercholesterolemia and an imbalance of peripheral leukocyte counts, leading to arterial leukocyte infiltration, are considered independent risk factors for atherosclerosis. However, in this issue of the JCI, Murphy and colleagues identify a mechanistic link between hypercholesterolemia, leukocytosis, and the subsequent development of atherosclerotic lesions in mice. These findings could pave the way for the development of novel treatment strategies to control leukocyte homeostasis and atherosclerosis. Citation Information: J Clin Invest. 2011;121(10):3828-3831. https://doi.org/10.1172/JCI59763. Oculocutaneous albinism (OCA) is a group of genetic disorders characterized by hypopigmentation of the skin, hair, and eyes. Affected individuals experience reduced visual acuity and substantially increased skin cancer risk. There are four major types of OCA (OCA1–OCA4) that result from disruption in production of melanin from tyrosine. Current treatment options for individuals with OCA are limited to attempts to correct visual problems and counseling to promote use of sun protective measures. However, Onojafe et al., reporting in this issue of the JCI, provide hope for a new treatment approach for OCA, as they demonstrate that treating mice that model OCA-1b with nitisinone, which is FDA approved for treating hereditary tyrosinemia type 1, elevates plasma tyrosine levels, and increases eye and hair pigmentation. Citation Information: J Clin Invest. 2011;121(10):3831-3833. https://doi.org/10.1172/JCI60005. Medulloblastoma is the most common malignant brain tumor in children. Overall survival rates have improved in recent years as a result of risk-stratified treatment regimens. However, medulloblastoma remains associated with substantial mortality, and survivors often experience debilitating neurological, endocrinological, and social sequelae as a result of treatment. Targeted and less toxic therapeutic strategies are therefore needed. In this issue of the JCI, Baryawno et al. report their findings that a large percentage of primary medulloblastomas and medulloblastoma cell lines are infected with human cytomegalovirus (HCMV) and suggest that targeting this virus could provide a new way to treat individuals with medulloblastoma. Citation Information: J Clin Invest. 2011;121(10):3834-3845. https://doi.org/10.1172/JCI37210. A fundamental goal in cancer research is the identification of the cell types and signaling pathways capable of initiating and sustaining tumor growth, as this has the potential to reveal therapeutic targets. Stem and progenitor cells have been implicated in the genesis of select lymphoid malignancies. However, the identity of the cells in which mature lymphoid neoplasms are initiated remains unclear. Here, we investigate the origin of peripheral T cell lymphomas using mice in which Snf5, a chromatin remodelling–complex subunit with tumor suppressor activity, could be conditionally inactivated in developing T cells. In this model of mature peripheral T cell lymphomas, the cell of origin was a mature CD44hiCD122loCD8+ T cell that resembled a subset of memory cells that has capacity for self-renewal and robust expansion, features shared with stem cells. Further analysis showed that Snf5 loss led to activation of a Myc-driven signaling network and stem cell transcriptional program. Finally, lymphomagenesis and lymphoma proliferation depended upon TCR signaling, establishing what we believe to be a new paradigm for lymphoid malignancy growth. These findings suggest that the self-renewal and robust proliferative capacities of memory T cells are associated with vulnerability to oncogenic transformation. Our findings further suggest that agents that impinge upon TCR signaling may represent an effective therapeutic modality for this class of lethal human cancers. Citation Information: J Clin Invest. 2011;121(10):3846-3859. https://doi.org/10.1172/JCI44952. Immune cells are key regulators of neoplastic progression, which is often mediated through their release of cytokines. Inflammatory cytokines such as IL-6 exert tumor-promoting activities by driving growth and survival of neoplastic cells. However, whether these cytokines also have a role in recruiting mediators of adaptive anticancer immunity has not been investigated. Here, we report that homeostatic trafficking of tumor-reactive CD8+ T cells across microvascular checkpoints is limited in tumors despite the presence of inflammatory cytokines. Intravital imaging in tumor-bearing mice revealed that systemic thermal therapy (core temperature elevated to 39.5°C ± 0.5°C for 6 hours) activated an IL-6 trans-signaling program in the tumor blood vessels that modified the vasculature such that it could support enhanced trafficking of CD8+ effector/memory T cells (Tems) into tumors. A concomitant decrease in tumor infiltration by Tregs during systemic thermal therapy resulted in substantial enhancement of Tem/Treg ratios. Mechanistically, IL-6 produced by nonhematopoietic stromal cells acted cooperatively with soluble IL-6 receptor–α and thermally induced gp130 to promote E/P-selectin– and ICAM-1–dependent extravasation of cytotoxic T cells in tumors. Parallel increases in vascular adhesion were induced by IL-6/soluble IL-6 receptor–α fusion protein in mouse tumors and patient tumor explants. Finally, a causal link was established between IL-6–dependent licensing of tumor vessels for Tem trafficking and apoptosis of tumor targets. These findings suggest that the unique IL-6–rich tumor microenvironment can be exploited to create a therapeutic window to boost T cell–mediated antitumor immunity and immunotherapy. Citation Information: J Clin Invest. 2011;121(10):3860-3871. https://doi.org/10.1172/JCI45963. It is well established that allergy development can be prevented by repeated low-dose exposure to contact allergens. Exactly which immune mechanisms are responsible for this so-called low zone tolerance (LZT) is not clear, although CD8+ suppressor T cells are known to have a role. Here, we show that TNF released by tolerogenic CD11+CD8+ DCs located in skin-draining lymph nodes is required and sufficient for development of tolerance to contact allergens in mice. DC-derived TNF protected mice from contact allergy by inducing apoptosis in allergen-specific effector CD8+ T cells via TNF receptor 2 but did not contribute to the generation and function of the regulatory T cells associated with LZT. The TNF-mediated killing mechanism was induced in an allergen-specific manner. Activation of tolerogenic DCs by LZT CD8+ suppressor T cells and enhanced TNF receptor 2 expression on contact allergen–specific CD8+ effector T cells were required for LZT. Our findings may explain how tolerance protects from allergic diseases, which could allow for the development of new strategies for allergy prevention. Citation Information: J Clin Invest. 2011;121(10):3872-3876. https://doi.org/10.1172/JCI44254. T cells recognize antigens via their cell surface TCR and are classified as either αβ or γδ depending on the variable chains in their TCR, α and β or γ and δ, respectively. Both αβ and γδ TCRs also contain several invariant chains, including CD3δ, which support surface TCR expression and transduce the TCR signal. Mutations in variable chains would be expected to affect a single T cell lineage, while mutations in the invariant chains would affect all T cells. Consistent with this, all CD3δ-deficient patients described to date showed a complete block in T cell development. However, CD3δ-KO mice have an αβ T cell–specific defect. Here, we report 2 unrelated cases of SCID with a selective block in αβ but not in γδ T cell development, associated with a new splicing mutation in the CD3D gene. The patients’ T cells showed reduced CD3D transcripts, CD3δ proteins, surface TCR, and early TCR signaling. Their lymph nodes showed severe T cell depletion, recent thymus emigrants in peripheral blood were strongly decreased, and the scant αβ T cells were oligoclonal. T cell–dependent B cell functions were also impaired, despite the presence of normal B cell numbers. Strikingly, despite the specific loss of αβ T cells, surface TCR expression was more reduced in γδ than in αβ T cells. Analysis of individuals with this CD3D mutation thus demonstrates the contrasting CD3δ requirements for αβ versus γδ T cell development and TCR expression in humans and highlights the diagnostic and clinical relevance of studying both TCR isotypes when a T cell defect is suspected. Citation Information: J Clin Invest. 2011;121(10):3877-3888. https://doi.org/10.1172/JCI59211. Loss of memory B cells occurs from the onset of HIV-1 infection and persists into the chronic stages of infection. Lack of survival of these cells, even in subjects being treated, could primarily be the consequence of an altered local microenvironment induced by HIV infection. In this study we showed that memory B cell survival was significantly decreased in aviremic successfully treated (ST) subjects compared with subjects who control viral load as a result of natural immunity (elite controller [EC]) or with uninfected control (HIV–) subjects. The lower survival levels observed in memory B cells from ST subjects were the result of disrupted IL-2 signaling that led to increased transcriptional activity of Foxo3a and increased expression of its proapoptotic target TRAIL. Notably, memory B cell survival in ST subjects was significantly enhanced by the addition of exogenous IL-2 in a Foxo3a-dependent manner. We further showed that Foxo3a silencing by siRNA resulted in decreased expression of TRAIL and apoptosis levels in memory B cells from ST subjects. Our results thus establish a direct role for Foxo3a/TRAIL signaling in the persistence of memory B cells and provide a mechanism for the reduced survival of memory B cells during HIV infection. This knowledge could be exploited for the development of therapeutic and preventative HIV vaccines. Citation Information: J Clin Invest. 2011;121(10):3889-3901. https://doi.org/10.1172/JCI57235. Mycobacterium tuberculosis causes widespread, persistent infection, often residing in macrophages that neither sterilize the bacilli nor allow them to cause disease. How macrophages restrict growth of pathogens is one of many aspects of human phagocyte biology whose study relies largely on macrophages differentiated from monocytes in vitro. However, such cells fail to recapitulate the phenotype of tissue macrophages in key respects, including that they support early, extensive replication of M. tuberculosis and die in several days. Here we found that human macrophages could survive infection, kill Mycobacterium bovis BCG, and severely limit the replication of M. tuberculosis for several weeks if differentiated in 40% human plasma under 5%–10% (physiologic) oxygen in the presence of GM-CSF and/or TNF-α followed by IFN-γ. Control was lost with fetal bovine serum, 20% oxygen, M-CSF, higher concentrations of cytokines, or premature exposure to IFN-γ. We believe that the new culture method will enable inquiries into the antimicrobial mechanisms of human macrophages. Citation Information: J Clin Invest. 2011;121(10):3902-3913. https://doi.org/10.1172/JCI45113. An estimated one-third of the world’s population is infected with Mycobacterium tuberculosis, although most affected individuals maintain a latent infection. This control is attributed to the formation of granulomas, cell masses largely comprising infected macrophages with T cells aggregated around them. Inflammatory DCs, characterized as CD11c+CD11b+Ly6C+, are also found in granulomas and are an essential component of the acute immune response to mycobacteria. However, their function during chronic infection is less well understood. Here, we report that CD11c+ cells dynamically traffic in and out of both acute and chronic granulomas induced by Mycobacterium bovis strain bacillus Calmette-Guérin (BCG) in mice. By transplanting Mycobacterium-induced granulomas containing fluorescently labeled CD11c+ cells and bacteria into unlabeled mice, we were able to follow CD11c+ cell trafficking and T cell activation. We found that half of the CD11c+ cells in chronic granulomas were exchanged within 1 week. Compared with tissue-resident DC populations, CD11c+ cells migrating out of granuloma-containing tissue had an unexpected systemic dissemination pattern. Despite low antigen availability, systemic CD4+ T cell priming still occurred during chronic infection. These data demonstrate that surveillance of granulomatous tissue by CD11c+ cells is continuous and that these cells are distinct from tissue-resident DC populations and support T cell priming during both stages of Mycobacterium infection. This intense DC surveillance may also be a feature of Mycobacterium tuberculosis infection and other granuloma-associated diseases. Citation Information: J Clin Invest. 2011;121(10):3914-3923. https://doi.org/10.1172/JCI59372. Mutation of the tyrosinase gene (TYR) causes oculocutaneous albinism, type 1 (OCA1), a condition characterized by reduced skin and eye melanin pigmentation and by vision loss. The retinal pigment epithelium influences postnatal visual development. Therefore, increasing ocular pigmentation in patients with OCA1 might enhance visual function. There are 2 forms of OCA1, OCA-1A and OCA-1B. Individuals with the former lack functional tyrosinase and therefore lack melanin, while individuals with the latter produce some melanin. We hypothesized that increasing plasma tyrosine concentrations using nitisinone, an FDA-approved inhibitor of tyrosine degradation, could stabilize tyrosinase and improve pigmentation in individuals with OCA1. Here, we tested this hypothesis in mice homozygous for either the Tyrc-2J null allele or the Tyrc-h allele, which model OCA-1A and OCA-1B, respectively. Only nitisinone-treated Tyrc-h/c-h mice manifested increased pigmentation in their fur and irides and had more pigmented melanosomes. High levels of tyrosine improved the stability and enzymatic function of the Tyrc-h protein and also increased overall melanin levels in melanocytes from a human with OCA-1B. These results suggest that the use of nitisinone in OCA-1B patients could improve their pigmentation and potentially ameliorate vision loss. Citation Information: J Clin Invest. 2011;121(10):3924-3931. https://doi.org/10.1172/JCI57867. In Alzheimer disease (AD), the intracerebral accumulation of amyloid-β (Aβ) peptides is a critical yet poorly understood process. Aβ clearance via the blood-brain barrier is reduced by approximately 30% in AD patients, but the underlying mechanisms remain elusive. ABC transporters have been implicated in the regulation of Aβ levels in the brain. Using a mouse model of AD in which the animals were further genetically modified to lack specific ABC transporters, here we have shown that the transporter ABCC1 has an important role in cerebral Aβ clearance and accumulation. Deficiency of ABCC1 substantially increased cerebral Aβ levels without altering the expression of most enzymes that would favor the production of Aβ from the Aβ precursor protein. In contrast, activation of ABCC1 using thiethylperazine (a drug approved by the FDA to relieve nausea and vomiting) markedly reduced Aβ load in a mouse model of AD expressing ABCC1 but not in such mice lacking ABCC1. Thus, by altering the temporal aggregation profile of Aβ, pharmacological activation of ABC transporters could impede the neurodegenerative cascade that culminates in the dementia of AD. Citation Information: J Clin Invest. 2011;121(10):3932-3942. https://doi.org/10.1172/JCI58400. Congenital hyperinsulinism (CHI) is the major cause of persistent neonatal hypoglycemia. CHI most often occurs due to mutations in the ABCC8 (which encodes sulfonylurea receptor 1) or KCNJ11 (which encodes the potassium channel Kir6.2) gene, which result in a lack of functional KATP channels in pancreatic β cells. Diffuse forms of CHI (DiCHI), in which all β cells are abnormal, often require subtotal pancreatectomy, whereas focal forms (FoCHI), which are characterized by localized hyperplasia of abnormal β cells, can be cured by resection of the lesion. Here, we characterized the in vitro kinetics of insulin secretion by pancreatic fragments from 6 DiCHI patients and by focal lesion and normal adjacent pancreas from 18 FoCHI patients. Responses of normal pancreas were similar to those reported for islets from adult organ donors. Compared with normal pancreas, basal insulin secretion was elevated in both FoCHI and DiCHI tissue. Affected tissues were heterogeneous in their secretory responses, with increased glucose levels often producing a rapid increase in insulin secretion that could be followed by a paradoxical decrease below prestimulatory levels. The KATP channel blocker tolbutamide was consistently ineffective in stimulating insulin secretion; conversely, the KATP channel activator diazoxide often caused an unanticipated increase in insulin secretion. These observed alterations in secretory behavior were similar in focal lesion and DiCHI tissue, and independent of the specific mutation in ABCC8 or KCNJ11. They cannot be explained by classic models of β cell function. Our results provide insight into the excessive and sometimes paradoxical changes in insulin secretion observed in CHI patients with inactivating mutations of KATP channels. Citation Information: J Clin Invest. 2011;121(10):3943-3953. https://doi.org/10.1172/JCI57522. Pneumococcal meningitis is the most common and severe form of bacterial meningitis. Fatality rates are substantial, and long-term sequelae develop in about half of survivors. Disease outcome has been related to the severity of the proinflammatory response in the subarachnoid space. The complement system, which mediates key inflammatory processes, has been implicated as a modulator of pneumococcal meningitis disease severity in animal studies. Additionally, SNPs in genes encoding complement pathway proteins have been linked to susceptibility to pneumococcal infection, although no associations with disease severity or outcome have been established. Here, we have performed a robust prospective nationwide genetic association study in patients with bacterial meningitis and found that a common nonsynonymous complement component 5 (C5) SNP (rs17611) is associated with unfavorable disease outcome. C5 fragment levels in cerebrospinal fluid (CSF) of patients with bacterial meningitis correlated with several clinical indicators of poor prognosis. Consistent with these human data, C5a receptor–deficient mice with pneumococcal meningitis had lower CSF wbc counts and decreased brain damage compared with WT mice. Adjuvant treatment with C5-specific monoclonal antibodies prevented death in all mice with pneumococcal meningitis. Thus, our results suggest C5-specific monoclonal antibodies could be a promising new antiinflammatory adjuvant therapy for pneumococcal meningitis. Citation Information: J Clin Invest. 2011;121(10):3954-3964. https://doi.org/10.1172/JCI57362. Antiviral Abs, for example those produced in response to influenza virus infection, are critical for virus neutralization and defense against secondary infection. While the half-life of Abs is short, Ab titers can last a lifetime due to a subset of the Ab-secreting cells (ASCs) that is long lived. However, the mechanisms governing ASC longevity are poorly understood. Here, we have identified a critical role for extrinsic cytokine signals in the survival of respiratory tract ASCs in a mouse model of influenza infection. Irradiation of mice at various time points after influenza virus infection markedly diminished numbers of lung ASCs, suggesting that they are short-lived and require extrinsic factors in order to persist. Neutralization of the TNF superfamily cytokines B lymphocyte stimulator (BLyS; also known as BAFF) and a proliferation-inducing ligand (APRIL) reduced numbers of antiviral ASCs in the lungs and bone marrow, whereas ASCs in the spleen and lung-draining lymph node were surprisingly unaffected. Mice deficient in transmembrane activator and calcium-modulator and cyclophilin ligand interactor (TACI), a receptor for BLyS and APRIL, mounted an initial antiviral B cell response similar to that generated in WT mice but failed to sustain protective Ab titers in the airways and serum, leading to increased susceptibility to secondary viral challenge. These studies highlight the importance of TACI signaling for the maintenance of ASCs and protection against influenza virus infection. Citation Information: J Clin Invest. 2011;121(10):3965-3980. https://doi.org/10.1172/JCI58552. Kidney podocytes are highly differentiated epithelial cells that form interdigitating foot processes with bridging slit diaphragms (SDs) that regulate renal ultrafiltration. Podocyte injury results in proteinuric kidney disease, and genetic deletion of SD-associated CD2-associated protein (CD2AP) leads to progressive renal failure in mice and humans. Here, we have shown that CD2AP regulates the TGF-β1–dependent translocation of dendrin from the SD to the nucleus. Nuclear dendrin acted as a transcription factor to promote expression of cytosolic cathepsin L (CatL). CatL proteolyzed the regulatory GTPase dynamin and the actin-associated adapter synaptopodin, leading to a reorganization of the podocyte microfilament system and consequent proteinuria. CD2AP itself was proteolyzed by CatL, promoting sustained expression of the protease during podocyte injury, and in turn increasing the apoptotic susceptibility of podocytes to TGF-β1. Our study identifies CD2AP as the gatekeeper of the podocyte TGF-β response through its regulation of CatL expression and defines a molecular mechanism underlying proteinuric kidney disease. Citation Information: J Clin Invest. 2011;121(10):3981-3990. https://doi.org/10.1172/JCI57301. In chronic kidney disease, fibroblast dysfunction causes renal fibrosis and renal anemia. Renal fibrosis is mediated by the accumulation of myofibroblasts, whereas renal anemia is mediated by the reduced production of fibroblast-derived erythropoietin, a hormone that stimulates erythropoiesis. Despite their importance in chronic kidney disease, the origin and regulatory mechanism of fibroblasts remain unclear. Here, we have demonstrated that the majority of erythropoietin-producing fibroblasts in the healthy kidney originate from myelin protein zero–Cre (P0-Cre) lineage-labeled extrarenal cells, which enter the embryonic kidney at E13.5. In the diseased kidney, P0-Cre lineage-labeled fibroblasts, but not fibroblasts derived from injured tubular epithelial cells through epithelial-mesenchymal transition, transdifferentiated into myofibroblasts and predominantly contributed to fibrosis, with concomitant loss of erythropoietin production. We further demonstrated that attenuated erythropoietin production in transdifferentiated myofibroblasts was restored by the administration of neuroprotective agents, such as dexamethasone and neurotrophins. Moreover, the in vivo administration of tamoxifen, a selective estrogen receptor modulator, restored attenuated erythropoietin production as well as fibrosis in a mouse model of kidney fibrosis. These findings reveal the pathophysiological roles of P0-Cre lineage-labeled fibroblasts in the kidney and clarify the link between renal fibrosis and renal anemia. Citation Information: J Clin Invest. 2011;121(10):3991-4002. https://doi.org/10.1172/JCI45563. B cell activation factor of the TNF family (BAFF) is a potent B cell survival factor. BAFF overexpressing transgenic mice (BAFF-Tg mice) exhibit features of autoimmune disease, including B cell hyperplasia and hypergammaglobulinemia, and develop fatal nephritis with age. However, basal serum IgA levels are also elevated, suggesting that the pathology in these mice may be more complex than initially appreciated. Consistent with this, we demonstrate here that BAFF-Tg mice have mesangial deposits of IgA along with high circulating levels of polymeric IgA that is aberrantly glycosylated. Renal disease in BAFF-Tg mice was associated with IgA, because serum IgA was highly elevated in nephritic mice and BAFF-Tg mice with genetic deletion of IgA exhibited less renal pathology. The presence of commensal flora was essential for the elevated serum IgA phenotype, and, unexpectedly, commensal bacteria–reactive IgA antibodies were found in the blood. These data illustrate how excess B cell survival signaling perturbs the normal balance with the microbiota, leading to a breach in the normal mucosal-peripheral compartmentalization. Such breaches may predispose the nonmucosal system to certain immune diseases. Indeed, we found that a subset of patients with IgA nephropathy had elevated serum levels of a proliferation inducing ligand (APRIL), a cytokine related to BAFF. These parallels between BAFF-Tg mice and human IgA nephropathy may provide a new framework to explore connections between mucosal environments and renal pathology. Citation Information: J Clin Invest. 2011;121(10):4003-4014. https://doi.org/10.1172/JCI58662. Sepsis-associated acute kidney injury (AKI) is a common and morbid condition that is distinguishable from typical ischemic renal injury by its paucity of tubular cell death. The mechanisms underlying renal dysfunction in individuals with sepsis-associated AKI are therefore less clear. Here we have shown that endotoxemia reduces oxygen delivery to the kidney, without changing tissue oxygen levels, suggesting reduced oxygen consumption by the kidney cells. Tubular mitochondria were swollen, and their function was impaired. Expression profiling showed that oxidative phosphorylation genes were selectively suppressed during sepsis-associated AKI and reactivated when global function was normalized. PPARγ coactivator–1α (PGC-1α), a major regulator of mitochondrial biogenesis and metabolism, not only followed this pattern but was proportionally suppressed with the degree of renal impairment. Furthermore, tubular cells had reduced PGC-1α expression and oxygen consumption in response to TNF-α; however, excess PGC-1α reversed the latter effect. Both global and tubule-specific PGC-1α–knockout mice had normal basal renal function but suffered persistent injury following endotoxemia. Our results demonstrate what we believe to be a novel mechanism for sepsis-associated AKI and suggest that PGC-1α induction may be necessary for recovery from this disorder, identifying a potential new target for future therapeutic studies. Citation Information: J Clin Invest. 2011;121(10):4015-4029. https://doi.org/10.1172/JCI45862. Cancer immunotherapeutic approaches induce tumor-specific immune responses, in particular CTL responses, in many patients treated. However, such approaches are clinically beneficial to only a few patients. We set out to investigate one possible explanation for the failure of CTLs to eliminate tumors, specifically, the concept that this failure is not dependent on inhibition of T cell function. In a previous study, we found that in mice, myeloid-derived suppressor cells (MDSCs) are a source of the free radical peroxynitrite (PNT). Here, we show that pre-treatment of mouse and human tumor cells with PNT or with MDSCs inhibits binding of processed peptides to tumor cell–associated MHC, and as a result, tumor cells become resistant to antigen-specific CTLs. This effect was abrogated in MDSCs treated with a PNT inhibitor. In a mouse model of tumor-associated inflammation in which the antitumor effects of antigen-specific CTLs are eradicated by expression of IL-1β in the tumor cells, we determined that therapeutic failure was not caused by more profound suppression of CTLs by IL-1β–expressing tumors than tumors not expressing this proinflammatory cytokine. Rather, therapeutic failure was a result of the presence of PNT. Clinical relevance for these data was suggested by the observation that myeloid cells were the predominant source of PNT in human lung, pancreatic, and breast cancer samples. Our data therefore suggest what we believe to be a novel mechanism of MDSC-mediated tumor cell resistance to CTLs. Citation Information: J Clin Invest. 2011;121(10):4030-4042. https://doi.org/10.1172/JCI45114. While there is evidence that specific T cell populations can promote the growth of established tumors, instances where T cell activity causes neoplasms to arise de novo are infrequent. Here, we employed two conditional mutagenesis systems to delete the TGF-β signaling pathway component Smad4 in T cells and observed the spontaneous development of massive polyps within the gastroduodenal regions of mice. The epithelial lesions contained increased levels of transcripts encoding IL-11, IL-6, TGF-β, IL-1β, and TNF-α, and lamina propria cells isolated from lesions contained abundant IL-17A+CD4+ T cells. Furthermore, we found that Smad4 deficiency attenuated TGF-β–mediated in vitro polarization of FoxP3+CD4+ T cells, but not IL-17A+CD4+ T cells, suggesting that the epithelial lesions may have arisen as a consequence of unchecked Th17 cell activity. Proinflammatory cytokine production likely accounted for the raised levels of IL-11, a cytokine known to promote gastric epithelial cell survival and hyperplasia. Consistent with IL-11 having a pathogenic role in this model, we found evidence of Stat3 activation in the gastric polyps. Thus, our data indicate that a chronic increase in gut Th17 cell activity can be associated with the development of premalignant lesions of the gastroduodenal region. Citation Information: J Clin Invest. 2011;121(10):4043-4055. https://doi.org/10.1172/JCI57147. Medulloblastomas are the most common malignant brain tumors in children. They express high levels of COX-2 and produce PGE2, which stimulates tumor cell proliferation. Human cytomegalovirus (HCMV) is prevalent in the human population and encodes proteins that provide immune evasion strategies and promote oncogenic transformation and oncomodulation. In particular, HCMV induces COX-2 expression; STAT3 phosphorylation; production of PGE2, vascular endothelial growth factor, and IL-6; and tumor formation in vivo. Here, we show that a large proportion of primary medulloblastomas and medulloblastoma cell lines are infected with HCMV and that COX-2 expression, along with PGE2 levels, in tumors is directly modulated by the virus. Our analysis indicated that both HCMV immediate-early proteins and late proteins are expressed in the majority of primary medulloblastomas. Remarkably, all of the human medulloblastoma cell lines that we analyzed contained HCMV DNA and RNA and expressed HCMV proteins at various levels in vitro. When engrafted into immunocompromised mice, human medulloblastoma cells induced expression of HCMV proteins. HCMV and COX-2 expression correlated in primary tumors, cell lines, and medulloblastoma xenografts. The antiviral drug valganciclovir and the specific COX-2 inhibitor celecoxib prevented HCMV replication in vitro and inhibited PGE2 production and reduced medulloblastoma tumor cell growth both in vitro and in vivo. Ganciclovir did not affect the growth of HCMV-negative tumor cell lines. These findings imply an important role for HCMV in medulloblastoma and suggest HCMV as a novel therapeutic target for this tumor. Citation Information: J Clin Invest. 2011;121(10):4056-4069. https://doi.org/10.1172/JCI44228. The acquisition of a mesenchymal phenotype is a critical step in the metastatic progression of epithelial carcinomas. Adherens junctions (AJs) are required for suppressing this epithelial-mesenchymal transition (EMT) but less is known about the role of tight junctions (TJs) in this process. Here, we investigated the functions of blood vessel epicardial substance (BVES, also known as POPDC1 and POP1), an integral membrane protein that regulates TJ formation. BVES was found to be underexpressed in all stages of human colorectal carcinoma (CRC) and in adenomatous polyps, indicating its suppression occurs early in transformation. Similarly, the majority of CRC cell lines tested exhibited decreased BVES expression and promoter DNA hypermethylation, a modification associated with transcriptional silencing. Treatment with a DNA-demethylating agent restored BVES expression in CRC cell lines, indicating that methylation represses BVES expression. Reexpression of BVES in CRC cell lines promoted an epithelial phenotype, featuring decreased proliferation, migration, invasion, and anchorage-independent growth; impaired growth of an orthotopic xenograft; and blocked metastasis. Conversely, interfering with BVES function by expressing a dominant-negative mutant in human corneal epithelial cells induced mesenchymal features. These biological outcomes were associated with changes in AJ and TJ composition and related signaling. Therefore, BVES prevents EMT, and its epigenetic silencing may be an important step in promoting EMT programs during colon carcinogenesis. Citation Information: J Clin Invest. 2011;121(10):4070-4081. https://doi.org/10.1172/JCI46305. Aging is a major risk factor for the progression of neurodegenerative diseases, including Huntington disease (HD). Reduced neuronal IGF1 or Irs2 signaling have been shown to extend life span in mice. To determine whether Irs2 signaling modulates neurodegeneration in HD, we genetically modulated Irs2 concentrations in the R6/2 mouse model of HD. Increasing Irs2 levels in the brains of R6/2 mice significantly reduced life span and increased neuronal oxidative stress and mitochondrial dysfunction. In contrast, reducing Irs2 levels throughout the body (except in β cells, where Irs2 expression is needed to prevent diabetes onset; R6/2•Irs2+/–•Irs2βtg mice) improved motor performance and extended life span. The slower progression of HD-like symptoms was associated with increased nuclear localization of the transcription factor FoxO1 and increased expression of FoxO1-dependent genes that promote autophagy, mitochondrial function, and resistance to oxidative stress. Mitochondrial function improved and the number of autophagosomes increased in R6/2•Irs2+/–•Irs2βtg mice, whereas aggregate formation and oxidative stress decreased. Thus, our study suggests that Irs2 signaling can modulate HD progression. Since we found the expression of Irs2 to be normal in grade II HD patients, our results suggest that decreasing IRS2 signaling could be part of a therapeutic approach to slow the progression of HD. Citation Information: J Clin Invest. 2011;121(10):4082-4094. https://doi.org/10.1172/JCI57398. Hypokalemic periodic paralysis (HypoPP) is an ion channelopathy of skeletal muscle characterized by attacks of muscle weakness associated with low serum K+. HypoPP results from a transient failure of muscle fiber excitability. Mutations in the genes encoding a calcium channel (CaV1.1) and a sodium channel (NaV1.4) have been identified in HypoPP families. Mutations of NaV1.4 give rise to a heterogeneous group of muscle disorders, with gain-of-function defects causing myotonia or hyperkalemic periodic paralysis. To address the question of specificity for the allele encoding the NaV1.4-R669H variant as a cause of HypoPP and to produce a model system in which to characterize functional defects of the mutant channel and susceptibility to paralysis, we generated knockin mice carrying the ortholog of the gene encoding the NaV1.4-R669H variant (referred to herein as R669H mice). Homozygous R669H mice had a robust HypoPP phenotype, with transient loss of muscle excitability and weakness in low-K+ challenge, insensitivity to high-K+ challenge, dominant inheritance, and absence of myotonia. Recovery was sensitive to the Na+/K+-ATPase pump inhibitor ouabain. Affected fibers had an anomalous inward current at hyperpolarized potentials, consistent with the proposal that a leaky gating pore in R669H channels triggers attacks, whereas a reduction in the amplitude of action potentials implies additional loss-of-function changes for the mutant NaV1.4 channels. Citation Information: J Clin Invest. 2011;121(10):4095-4105. https://doi.org/10.1172/JCI58818. Somatic mutations and copy number alterations (as a result of deletion or amplification of large portions of a chromosome) are major drivers of human lung cancers. Detailed analysis of lung cancer–associated chromosomal amplifications could identify novel oncogenes. By performing an integrative cytogenetic and gene expression analysis of non–small-cell lung cancer (NSCLC) and small-cell lung cancer (SCLC) cell lines and tumors, we report here the identification of a frequently recurring amplification at chromosome 11 band p13. Within this region, only TNF receptor–associated factor 6 (TRAF6) exhibited concomitant mRNA overexpression and gene amplification in lung cancers. Inhibition of TRAF6 in human lung cancer cell lines suppressed NF-κB activation, anchorage-independent growth, and tumor formation. In these lung cancer cell lines, RAS required TRAF6 for its oncogenic capabilities. Furthermore, TRAF6 overexpression in NIH3T3 cells resulted in NF-κB activation, anchorage-independent growth, and tumor formation. Our findings show that TRAF6 is an oncogene that is important for RAS-mediated oncogenesis and provide a mechanistic explanation for the previously apparent importance of constitutive NF-κB activation in RAS-driven lung cancers. Citation Information: J Clin Invest. 2011;121(10):4106-4117. https://doi.org/10.1172/JCI42754. Pancreatic ductal adenocarcinoma (PDAC), one of the most lethal neoplasms, is characterized by an expanded stroma with marked fibrosis (desmoplasia). We previously generated pancreas epithelium–specific TGF-β receptor type II (Tgfbr2) knockout mice in the context of Kras activation (mice referred to herein as Kras+Tgfbr2KO mice) and found that they developed aggressive PDAC that recapitulated the histological manifestations of the human disease. The mouse PDAC tissue showed strong expression of connective tissue growth factor (Ctgf), a profibrotic and tumor-promoting factor, especially in the tumor-stromal border area, suggesting an active tumor-stromal interaction. Here we show that the PDAC cells in Kras+Tgfbr2KO mice secreted much higher levels of several Cxc chemokines compared with mouse pancreatic intraepithelial neoplasia cells, which are preinvasive. The Cxc chemokines induced Ctgf expression in the pancreatic stromal fibroblasts, not in the PDAC cells themselves. Subcutaneous grafting studies revealed that the fibroblasts enhanced growth of PDAC cell allografts, which was attenuated by Cxcr2 inhibition. Moreover, treating the Kras+Tgfbr2KO mice with the CXCR2 inhibitor reduced tumor progression. The decreased tumor progression correlated with reduced Ctgf expression and angiogenesis and increased overall survival. Taken together, our data indicate that tumor-stromal interactions via a Cxcr2-dependent chemokine and Ctgf axis can regulate PDAC progression. Further, our results suggest that inhibiting tumor-stromal interactions might be a promising therapeutic strategy for PDAC. Citation Information: J Clin Invest. 2011;121(10):4118-4126. https://doi.org/10.1172/JCI57883. The fatal adult motor neuron disease amyotrophic lateral sclerosis (ALS) shares some clinical and pathological overlap with frontotemporal dementia (FTD), an early-onset neurodegenerative disorder. The RNA/DNA-binding proteins fused in sarcoma (FUS; also known as TLS) and TAR DNA binding protein-43 (TDP-43) have recently been shown to be genetically and pathologically associated with familial forms of ALS and FTD. It is currently unknown whether perturbation of these proteins results in disease through mechanisms that are independent of normal protein function or via the pathophysiological disruption of molecular processes in which they are both critical. Here, we report that Drosophila mutants in which the homolog of FUS is disrupted exhibit decreased adult viability, diminished locomotor speed, and reduced life span compared with controls. These phenotypes were fully rescued by wild-type human FUS, but not ALS-associated mutant FUS proteins. A mutant of the Drosophila homolog of TDP-43 had similar, but more severe, deficits. Through cross-rescue analysis, we demonstrated that FUS acted together with and downstream of TDP-43 in a common genetic pathway in neurons. Furthermore, we found that these proteins associated with each other in an RNA-dependent complex. Our results establish that FUS and TDP-43 function together in vivo and suggest that molecular pathways requiring the combined activities of both of these proteins may be disrupted in ALS and FTD. Citation Information: J Clin Invest. 2011;121(10):4127-4137. https://doi.org/10.1172/JCI46458. The specialized epithelial cell of the kidney, the podocyte, has a complex actin-based cytoskeleton. Dynamic regulation of this cytoskeleton is required for efficient barrier function of the kidney. Podocytes are a useful cell type to study the control of the actin cytoskeleton in vivo, because disruption of components of the cytoskeleton results in podocyte damage, cell loss, and a prototypic injury response called focal segmental glomerulosclerosis (FSGS). Searching for actin regulatory proteins that are expressed in podocytes, we identified a RhoA-activated Rac1 GTPase-activating protein (Rac1-GAP), Arhgap24, that was upregulated in podocytes as they differentiated, both in vitro and in vivo. Increased levels of active Rac1 and Cdc42 were measured in Arhgap24 knockdown experiments, which influenced podocyte cell shape and membrane dynamics. Consistent with a role for Arhgap24 in normal podocyte functioning in vivo, sequencing of the ARHGAP24 gene in patients with FSGS identified a mutation that impaired its Rac1-GAP activity and was associated with disease in a family with FSGS. Thus, Arhgap24 contributes to the careful balancing of RhoA and Rac1 signaling in podocytes, the disruption of which may lead to kidney disease. Citation Information: J Clin Invest. 2011;121(10):4138-4149. https://doi.org/10.1172/JCI57559. Leukocytosis is associated with increased cardiovascular disease risk in humans and develops in hypercholesterolemic atherosclerotic animal models. Leukocytosis is associated with the proliferation of hematopoietic stem and multipotential progenitor cells (HSPCs) in mice with deficiencies of the cholesterol efflux–promoting ABC transporters ABCA1 and ABCG1 in BM cells. Here, we have determined the role of endogenous apolipoprotein-mediated cholesterol efflux pathways in these processes. In Apoe–/– mice fed a chow or Western-type diet, monocytosis and neutrophilia developed in association with the proliferation and expansion of HSPCs in the BM. In contrast, Apoa1–/– mice showed no monocytosis compared with controls. ApoE was found on the surface of HSPCs, in a proteoglycan-bound pool, where it acted in an ABCA1- and ABCG1-dependent fashion to decrease cell proliferation. Accordingly, competitive BM transplantation experiments showed that ApoE acted cell autonomously to control HSPC proliferation, monocytosis, neutrophilia, and monocyte accumulation in atherosclerotic lesions. Infusion of reconstituted HDL and LXR activator treatment each reduced HSPC proliferation and monocytosis in Apoe–/– mice. These studies suggest a specific role for proteoglycan-bound ApoE at the surface of HSPCs to promote cholesterol efflux via ABCA1/ABCG1 and decrease cell proliferation, monocytosis, and atherosclerosis. Although endogenous apoA-I was ineffective, pharmacologic approaches to increasing cholesterol efflux suppressed stem cell proliferative responses. Citation Information: J Clin Invest. 2011;121(10):4150-4160. https://doi.org/10.1172/JCI58414. Proteasomes are multisubunit proteases that play a critical role in maintaining cellular function through the selective degradation of ubiquitinated proteins. When 3 additional β subunits, expression of which is induced by IFN-γ, are substituted for their constitutively expressed counterparts, the structure is converted to an immunoproteasome. However, the underlying roles of immunoproteasomes in human diseases are poorly understood. Using exome analysis, we found a homozygous missense mutation (G197V) in immunoproteasome subunit, β type 8 (PSMB8), which encodes one of the β subunits induced by IFN-γ in patients from 2 consanguineous families. Patients bearing this mutation suffered from autoinflammatory responses that included recurrent fever and nodular erythema together with lipodystrophy. This mutation increased assembly intermediates of immunoproteasomes, resulting in decreased proteasome function and ubiquitin-coupled protein accumulation in the patient’s tissues. In the patient’s skin and B cells, IL-6 was highly expressed, and there was reduced expression of PSMB8. Downregulation of PSMB8 inhibited the differentiation of murine and human adipocytes in vitro, and injection of siRNA against Psmb8 in mouse skin reduced adipocyte tissue volume. These findings identify PSMB8 as an essential component and regulator not only of inflammation, but also of adipocyte differentiation, and indicate that immunoproteasomes have pleiotropic functions in maintaining the homeostasis of a variety of cell types. Citation Information: J Clin Invest. 2011;121(10):4161-4169. https://doi.org/10.1172/JCI57873. Obesity is a worldwide epidemic resulting in part from the ubiquity of high-calorie foods and food images. Whether obese and nonobese individuals regulate their desire to consume high-calorie foods differently is not clear. We set out to investigate the hypothesis that circulating levels of glucose, the primary fuel source for the brain, influence brain regions that regulate the motivation to consume high-calorie foods. Using functional MRI (fMRI) combined with a stepped hyperinsulinemic euglycemic-hypoglycemic clamp and behavioral measures of interest in food, we have shown here that mild hypoglycemia preferentially activates limbic-striatal brain regions in response to food cues to produce a greater desire for high-calorie foods. In contrast, euglycemia preferentially activated the medial prefrontal cortex and resulted in less interest in food stimuli. Indeed, higher circulating glucose levels predicted greater medial prefrontal cortex activation, and this response was absent in obese subjects. These findings demonstrate that circulating glucose modulates neural stimulatory and inhibitory control over food motivation and suggest that this glucose-linked restraining influence is lost in obesity. Strategies that temper postprandial reductions in glucose levels might reduce the risk of overeating, particularly in environments inundated with visual cues of high-calorie foods. Citation Information: J Clin Invest. 2011;121(10):4170-4179. https://doi.org/10.1172/JCI59255. Crohn disease (CD) and ulcerative colitis (UC) are increasingly common, chronic forms of inflammatory bowel disease. The behavior of these diseases varies unpredictably among patients. Identification of reliable prognostic biomarkers would enable treatment to be personalized so that patients destined to experience aggressive disease could receive appropriately potent therapies from diagnosis, while those who will experience more indolent disease are not exposed to the risks and side effects of unnecessary immunosuppression. Using transcriptional profiling of circulating T cells isolated from patients with CD and UC, we identified analogous CD8+ T cell transcriptional signatures that divided patients into 2 otherwise indistinguishable subgroups. In both UC and CD, patients in these subgroups subsequently experienced very different disease courses. A substantially higher incidence of frequently relapsing disease was experienced by those patients in the subgroup defined by elevated expression of genes involved in antigen-dependent T cell responses, including signaling initiated by both IL-7 and TCR ligation — pathways previously associated with prognosis in unrelated autoimmune diseases. No equivalent correlation was observed with CD4+ T cell gene expression. This suggests that the course of otherwise distinct autoimmune and inflammatory conditions may be influenced by common pathways and identifies what we believe to be the first biomarker that can predict prognosis in both UC and CD from diagnosis, a major step toward personalized therapy. Citation Information: J Clin Invest. 2011;121(10):4180-4191. https://doi.org/10.1172/JCI46139. Mast cell degranulation is important in the pathogenesis of anaphylaxis and allergic disorders. Many animal venoms contain components that can induce mast cell degranulation, and this has been thought to contribute to the pathology and mortality caused by envenomation. However, we recently reported evidence that mast cells can enhance the resistance of mice to the venoms of certain snakes and that mouse mast cell–derived carboxypeptidase A3 (CPA3) can contribute to this effect. Here, we investigated whether mast cells can enhance resistance to the venom of the Gila monster, a toxic component of that venom (helodermin), and the structurally similar mammalian peptide, vasoactive intestinal polypeptide (VIP). Using 2 types of mast cell–deficient mice, as well as mice selectively lacking CPA3 activity or the chymase mouse mast cell protease-4 (MCPT4), we found that mast cells and MCPT4, which can degrade helodermin, can enhance host resistance to the toxicity of Gila monster venom. Mast cells and MCPT4 also can limit the toxicity associated with high concentrations of VIP and can reduce the morbidity and mortality induced by venoms from 2 species of scorpions. Our findings support the notion that mast cells can enhance innate defense by degradation of diverse animal toxins and that release of MCPT4, in addition to CPA3, can contribute to this mast cell function. Citation Information: J Clin Invest. 2011;121(10):4192-4200. https://doi.org/10.1172/JCI60816. Citation Information: J Clin Invest. 2011;121(10):4201-4203. https://doi.org/10.1172/JCI60817.